People wait in line at a government employment office in the center of Madrid on April 30, 2010. 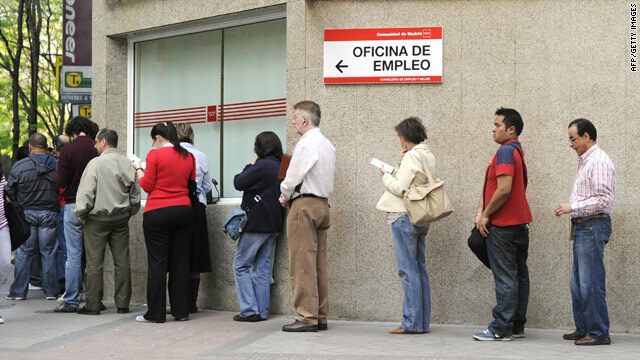 Madrid, Spain (CNN) -- Spain's unemployment rate rose to 20.09 percent for the second quarter of 2010, up from 20.05 percent from the previous quarter, Spain's National Statistics Institute said Friday. It is the highest level in 13 years, and it comes despite a rise in seasonal jobs for the summer. The figure means 4.6 million people are jobless in Spain. Spain has had one of the highest unemployment rates in the European Union, hovering near 20 percent for months. Data released earlier this month by Eurostat, the European statistics agency, showed the Baltic countries of Latvia and Estonia with similar jobless rates. The Eurostat figures, which were for May, showed overall unemployment in the 27-member European Union was at 9.6 percent.